The 52nd annual meeting of the American Society of Neuroradiology (ASNR) was held from May 17th through the 22nd at the Palais des congrès de Montréal in Montréal, Québec, Canada. Exceeding our presence in previous years, the Department of Radiology and Imaging Sciences had an extremely strong showing at this meeting. Altogether eleven faculty members and five fellows from the Neuroradiology division attended and participated in the organization, educational programming, or scientific content of the meeting. There were six invited lectures given by divisional faculty. An additional six oral scientific abstracts were presented including two by Neuroradiology fellows, as well as nine educational and scientific posters and electronic exhibits. The division also had extensive representation on virtually every ASNR committee, as well as several committee leadership positions. Dr. Carolyn Meltzer previously served as president of the ASNR from 2010-2011, and Dr. Patricia Hudgins served as president from 2005-2006. A social hour for past and present Emory faculty and fellows was held on Tuesday, May 20th with numerous former fellows and some former faculty turning out to reconnect and catch up. A few members of other divisions in the Department also turned out for the meeting and social hour. Emory’s strong showing at the meeting and increasing prominence in the society was very apparent, and something that we should be very proud of. Looking forward to another large Emory presence at ASNR 2015! 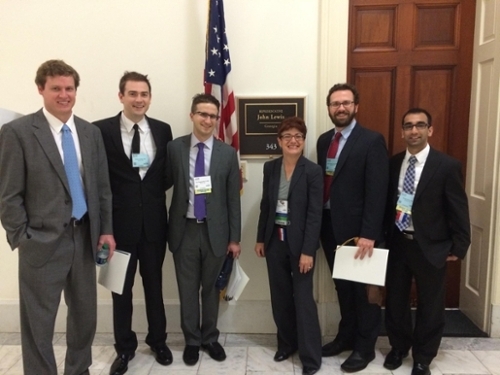 This past April, Emory Radiology faculty attended the American College of Radiology (ACR) 2014 annual meeting in Washington, DC. The Annual Meeting and Chapter Leadership Conference Meeting is an important assembly for shaping the future of our field in a changing health care delivery system. The ACR’s Resident and Fellow Section was well attended by our diagnostic radiology residents. Dr. Kimberly Applegate was instrumental in organizing this year’s meeting in her role as Speaker for the ACR Council.